The hi-hat stand is an essential part of every drum kit, as it supports arguably the most important cymbals. Aside from support, the stand also largely influences the tone you get from the hi-hat. It is, therefore, very important to equip your drum kit with a quality stand. If you’re on a hunt for your next hi-hat stand, here’s a list of my favorite models. Read on as I have reviewed some of the best hi hat stands out there and investigate what makes a good stand. 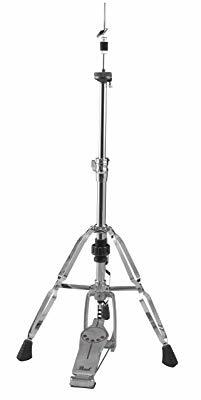 Here we have the H930 hi-hat stand, a member of the hugely popular Demonator series made by Pearl. This is a versatile, all-around option, made for both professional and casual use. The Demonator is a three-legged stand with the classic chain drive and sturdy construction. The legs are double-braced and made of durable materials. They feature rubber tips to prevent slipping. H930 is a medium-heavy model and can be folded for easier transport. The pedal is connected to a detachable floor board. It can easily be paired with a double bass drum pedal, thanks to the swivel design. The H930 also has a standard clutch on the top. It also comes with adjustable tension. It uses a threaded tension adjustment wheel, allowing you to easily dial in the right amount of resistance. This is one of my favorite budget hi-hat stands. The Pacific Drums 700-series PDHH700 is made with beginners and inexperienced players in mind. It is a great hi-hat stand for a practice drum kit and it can also serve as an emergency backup. This is a three-legged stand with double-braced legs, chain drive, and lightweight tubing. The legs are equipped with big multi-tread rubber feet for additional stability. The PDHH700 is a lightweight model, so you shouldn’t abuse it too much. The pedal is connected to a metal-rod base. As an entry-level model, the PDHH700 does not swivel and can’t accommodate a second bass drum pedal. The 5707 is a medium weight hi-hat stand from one of the world’s most famous manufacturers of drum hardware and accessories – Gibraltar. This bad boy belongs to the budget class and is one of the most widely used hi-hat stands in rehearsal studios. Due to its medium weight, 5707 can take a lot of punishment while still offer pretty decent stability. It is also foldable and easy to set up and take apart. The generous rubber padding on the legs provides additional grip. This is a standard three-legged stand with chain drive, a fast-touch G-branded pedalboard (w/ detachable radius rods), and an excellent height range (25”-36”). The legs can swivel the full 360 degrees, allowing you to easily add extra pedals. Thanks to its versatile construction, this durable hi-hat stand can be used in a wide variety of setups. That being said, heavy touring and professional studio use might not be recommendable. The Tama Speed Cobra 315 is just above the budget class and offers some serious versatility; a definite recommendation for metal drummers looking to upgrade their drum kits. 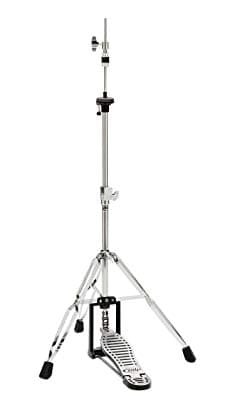 The Speed Cobra 315 is a two-legged hi-hat stand, which is pretty rare at its price point. The double-braced legs are equipped with large rubber feet. Like the rest of the two-leg models, the Cobra 315 can swivel to accommodate additional pedals. It is easy to assemble and take apart, and weighs only 8.9lbs. Instead of a regular chain mechanism (standard in this price class), this one has a direct pull action system. There are six predefined tension levels. The Drum Workshop CP9500TB is a great solution for drummers who are serious about stepping up their game. This is a two-leg stand with double-braced legs which end in rubber feet. The two-leg design combined with the swiveling construction helps minimize the clutter and free up space for additional pedals. The CP9500TB comes with a heavy-duty pedal attached to a robust chain action mechanism. It also features a lateral cymbal seat which allows easier cymbal angle adjustment. The clutch on the top is simple but very secure. The playing height is adjustable from 27” to 43”. Thanks to its robust construction, this hi-hat stand can be used in even the most demanding professional studio and stage settings. The first thing to consider when shopping for a hi-hat stand is its construction. Many variants exist, though they can be roughly divided into three major categories – three-leg stands, two-leg stands, and no-leg stands. The choice should mostly depend on your playing style and available room. Here’s a word or two on each of the three major types. Models with three legs are the most common and are used by the vast majority of professional and amateur drummers. Some three-leg models can swivel, allowing for the addition of extra pedals. On the other hand, fixed models are simpler and easier to use but don’t allow you to add pedals. These are made for drummers aiming to set up a basic drum kit. Three-legged models typically offer better stability than legless and two-legged models. They stand on their own and don’t need extra support. Two-legged models, as their name suggests, have only two legs. They face away from the player and use a rock plate as the third leg. The main selling points of two-leg stands are their ability to accommodate a number of additional pedals and the fact that they save a ton of space. Like their three-legged siblings, two-leg models don’t need additional support to stand. They are made for drummers who want more room without compromising the stability. The third and last major type is the so-called no-leg stand. True to its name, this stand only has a stand and a pedal with the rock plate at the bottom. Due to the minimalist construction, it needs to be attached to a cymbal stand or a rack. This type is usually the lightest and the most compact, and the most travel-friendly of the three major types. Drummers looking for maximum portability and minimum clutter should consider the no-leg variant. The weight and robustness of the stand are very important. These should depend on your playing style and your needs. For example, if you’re playing in a hard rock/metal band, you’d probably want to look into some heavier and more robust stands. On the other hand, if you play less aggressive music, a lighter model might do the job. If you perform frequently and have to transport and assemble/disassemble the equipment by yourself, a lighter, more portable stand might be the right choice. If you need a hi-hat stand for a recording/rehearsal studio drum kit, your playing style should be the most important factor. Another thing to consider here is the weight of your cymbals. Usually, your average stand should be able to support most of the cymbals out there. If you, on the other hand, use particularly big and heavy cymbals, you might want to invest in a stronger stand. Swivel is a very important feature, as it allows you to adjust the angle of the stand and add more pedals to your setup. The majority of two- and three-leg stands can swivel. However, flat-base models can’t. No-leg models can’t swivel either. The right choice here depends on your playing style. If you like to keep it simple, then a no-swivel model will do just fine. If on the other hand you need additional pedals, a stand which can swivel is a must. Resistance or spring tension is one of the key features of a hi-hat stand. It determines the “feel” of a stand and can greatly affect the playing experience. The right amount of tension differs from drummer to drummer and completely depends on personal taste. If you dial in too much resistance, you’ll tire easily. But if the resistance is too low, you might accidentally hit the hi-hat. Luckily, most of the stands come with adjustable tension. Some models come with pre-fixed tension levels, while others allow you to fine-tune the tension. Like with all other elements of hardware, the build is one of the essential features of a good hi-hat stand. You should look for something that’s made of quality materials and components. This is especially important if you perform frequently. Finally, the budget should also come into consideration. Ideally, it should be tailored according to what you want and need from your hi-hat stand. 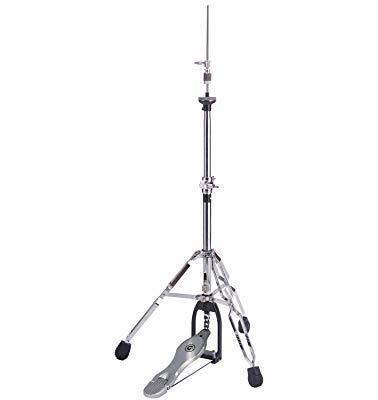 The prices can vary greatly, from well below $100 for budget models to several hundred for the high-end models, in case you're aiming for the absolute best hi hat stand. If you want a basic stand for casual use, a simple affordable stand might do the job. On the other hand, if you use additional pedals or gig frequently, a pricier option with extra features might be the right choice for you. When buying a hi-hat stand, there are many things to consider. Some of them include build quality, number of legs, ability to accommodate additional pedals, action, and many more. 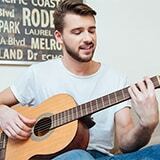 The decision should depend on your playing style and preferences, as well as budget.